In the predawn hours of Nov. 16, 1989, Father Ignacio Ellacuría and his fellow Jesuits were jarred awake by the pounding of fists and wooden clubs on the doors and windows of their residence. Outside, more than three dozen Salvadoran soldiers had surrounded the University of Central America’s (UCA) Pastoral Center, where the six priests lived. Forcing their way into the quiet residence, the soldiers dragged the Jesuits outside and ordered them to lie facedown on the ground. That morning, the world awakened to news of the most gruesome attack in El Salvador since the 1980 assassination of Archbishop Oscar Romero. The six Jesuits had been executed in their front garden, while their cook Julia Elba Ramos and her 15-year-old daughter Celina—who had taken refuge at the residence after fleeing violence near their own home—had been shot to death in the bed they shared. 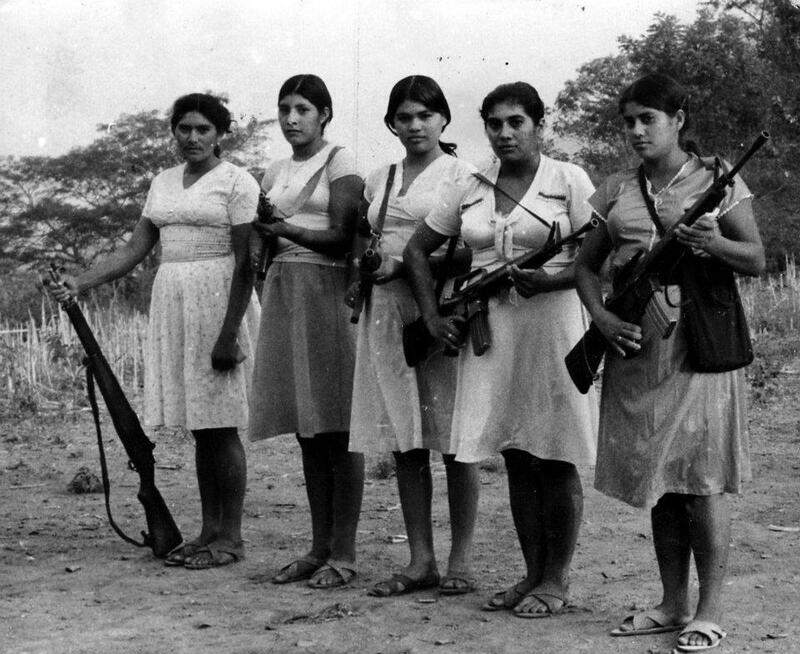 Women guerillas of the FMLN in El Salvador. November marks 25 years since the killings, which have become emblematic of the civil war that ravaged El Salvador in the 1980s. 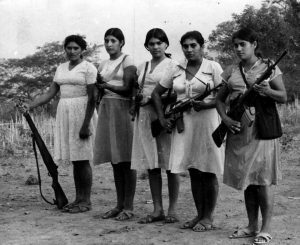 An estimated 75,000 Salvadorans were killed in the decade-long war between a people’s movement and a U.S.-backed military government. Father Ellacuría and his fellow Jesuits had responded to the violence by transforming UCA into a source of information about the political, economic, and social problems plaguing El Salvador. They documented the kidnappings, torture, and mass killings committed by military “death squads” and offered UCA as a venue for open debate. “Our mission to proclaim the Gospel [demands]of us a commitment to promote justice and enter into solidarity with the voiceless and the powerless,” he wrote in the fourth decree of the 32nd General Congregation. Following the murders, Father Currie traveled to El Salvador as a representative of Georgetown University. Many American Jesuits were coming to UCA’s aid, including the late Dean Brackley, S.J., who at the time was on the Fordham faculty. They found the capital, San Salvador, still embroiled in violence. 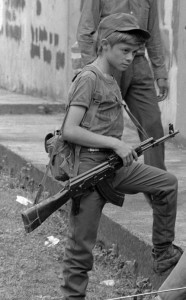 A boy soldier during the Salvadoran Civil War. At UCA, signs of the massacre were still evident. And yet, there were also signs of what UCA had been a part of before it bore witness to the events of Nov. 16. The campus was alive with students walking to class or stretched out on the grass talking with classmates. Despite the trauma it suffered, UCA had refused to allow its spirit to be violated. In the 25 years since the murders, Jesuit institutions have kept social justice at the core of their mission. A number of national initiatives evolved in direct response to El Salvador. Two of these are the Ignatian Family Teach-In for Justice, a yearly gathering to advocate for social justice issues, and the Ignatian Solidarity Network, which promotes leadership and advocacy among students and alumni. Individual Jesuit institutions have responded on the local level withthe same ardor. Many Jesuit schools have centers dedicated to social justice, such as Fordham’s Dorothy Day Center for Service and Justice. 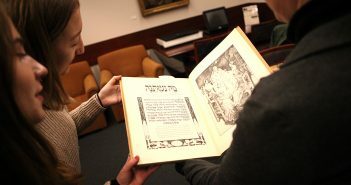 Grounded in the philosophy of “men and women for others,” the center connects Fordham with the local community to promote service and solidarity. On November 16, Jesuits around the world will remember those slain 25 years ago in El Salvador. Original paintings by Mary Pimmel-Freeman. 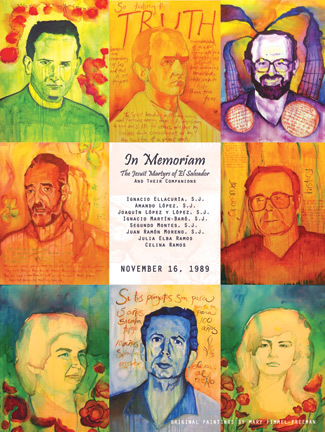 To mark the 25th anniversary of the murders, presidents of Jesuit colleges and universities, advocates, U.S. politicians, and many others will travel to El Salvador. The delegation will meet with the nation’s leaders about urgent issues in the aftermath of the war, as well as visit sites related to the Jesuit martyrs. The hope, Father Currie said, is to ensure for the Salvadoran people the justice that the Jesuits and their companions were denied. “Peace without justice is not enough,” he said. “That doesn’t mean we should seek vengeance. But it is very important that we name the injustice so that we get to the root of the problem. Otherwise, peace becomes very fragile. The Westchester campus will celebrate a special liturgyThursday, Nov. 13. Also on Thursday, Nov. 13 there will be a lecture at the Lincoln Center campus on the Jesuit martyrs and how they have influenced Jesuit institutions in the United States. Twenty students will be attending the Ignatian Family Teach-In from Nov. 15 to Nov. 17, where Fordham theology professor Michael Lee will also speak. 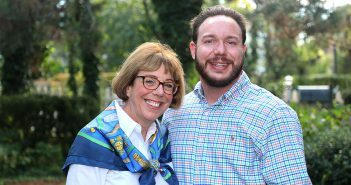 At Rose Hill, there will be a prayer vigil on Sunday, Nov. 16 at 7:30 p.m., followed by an 8 p.m. Mass in the University Church, celebrated by Claudio Burgaleta, S.J. A meal of pupusas, a traditional Salvadoran dish, will be served after Mass.